A new article in Nature Geoscience, Central West Antarctica among the most rapidly warming regions on Earth (subs. req’d), presents up-to-date information on conditions of the West Antarctic Ice Sheet (WAIS). The most common theme of climate science is present within this story: warming is occurring faster than scientists thought it was or projected just a few short years ago. This study compares its results against similar efforts and confirms some of the fears of the cryosphere. Large portions of both the Arctic and Antarctic are among the spots warming the fastest on Earth. What does this mean? It means accelerating sea level rise, influxes of fresh water into the world’s oceans, and rapidly changing ecosystems. It means there are likely other effects of anthropogenic global warming occurring across the globe, but because our observation networks are sparse, we’re just not aware of them yet. Figure 1. 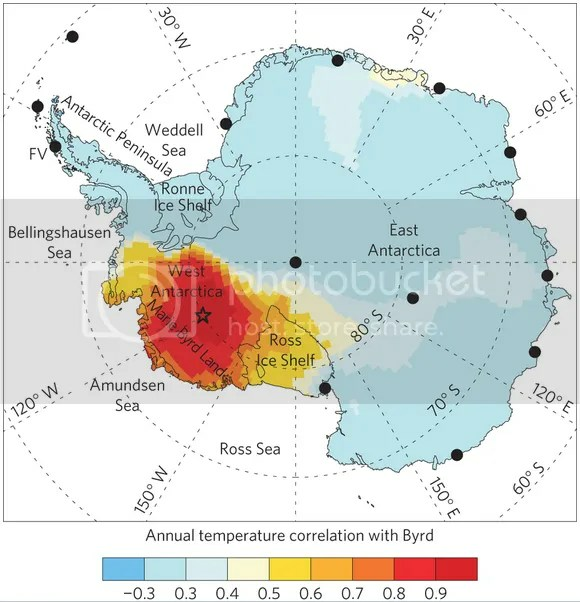 Color shadings show the correlation between the annual mean temperatures at Byrd and the annual mean temperatures at every other grid point in Antarctica, computed using ERA-Interim 2-meter temperature time series from 1979 to 2011. The star symbol denotes the location of Byrd Station. The black circles denote the locations of permanent research stations with long-term temperature records. The warming observed at Byrd Station is, by incorporating ERA-Interim reanalysis data, also exists across a significant portion of West Antarctica. This development’s significance is this: the WAIS rests on bedrock and is grounded below sea level. As the WAIS melts, the meltwater runs to the ocean from the land, raising sea levels. If sea level around Antarctica rises high enough, the bottom of the WAIS will be exposed to water, which will hasten its melt. Figure 2. Annual mean surface temperature change (trend×number of years) during 1958–2009 from the Byrd record (red and black circle) and from the CRUTEM4 data set (rest of map). Figure 2 puts the Byrd warming into global context. There are areas in the Arctic and now the Antarctic that have observed +2.4°C warming from 1958 through 2009. The long time period is representative for climate and the non-zero warming represents change. On a localized scale (WAIS), the warming observed at Byrd and likely at nearby locations probably counteracted the cooling resulting from increased circumpolar westerlies. Those westerlies, as I’ve written about in my State of the Poles posts, were themselves the result of cooling in the Antarctic stratosphere as ozone depletion occurred. In essence, the strong winds blowing across lines of longitude near Antarctica largely prevented warm air at higher latitudes from being blown across the continent. The Byrd warming therefore presents an interesting case where this phenomenon isn’t the only one that occurs. As the Montreal Protocol continues to reduce the amount of ozone-depleting substances in the stratosphere and the ozone layer replenishes itself, the anomalous westerlies will likely subside. As additional warm air is advected over Antarctica, the continent will experience fuller effects of global warming. In turn, the rest of the planet will experience the results of those effects. This is an example of one science policy working while another science policy remains mostly flatlined. The 2012 18th Conference of Parties continued to demonstrate that the same framework that allowed for the Montreal Protocol to be negotiated and successfully implemented has not and will not allow for a climate protocol. Decades have passed while negotiators have tried time and again to do the same thing over and over. A new approach is required. Local, bottom-up efforts need to be expanded and stoked. Someone somewhere has a much more effective set of solutions. Heck, a bunch of someones somewheres have solution sets. They need to be incubated and allowed to develop. We need to take control of those strategies and processes. Categories: environment, global warming, policy, science | Tags: AGW, Antarctica, climate science, COP18, cryosphere, Montreal Protocol, Nature Geoscience, policy, science policy, West Antarctic Ice Sheet | Permalink. I have gone at least halfway in meeting some of the Republican concerns. Did Americans vote for President Obama to go more than halfway in meeting Republican concerns? They did, even if they didn’t consciously think about it beforehand. This is a frightening admission. The start of fiscal curb impacts won’t start for another two weeks and Obama has already given up more than half the field to his opposition. How many football games would you win if you let the other team start at your 45-yard line? In the last four years, Obama’s defense hasn’t kept Republicans out of the end zone when he should have been scoring his own points. How far will Obama yield just to satisfy his own intense desire to make a deal with anybody, no matter how ridiculous they are? The American people are on the record rejecting Republican fiscal proposals, yet Obama continues to add them to his own proposal. If the stakes weren’t so high, it might be entertaining to watch how this unfolds. Categories: economy, framing, politics | Tags: capitulation, fiscal curb, fiscal policy | Permalink. Drought Continues To Affect Middle U.S. The percent area values haven’t changed too much since early July, but the specific areas impacted have moved around somewhat in response to weather systems in the intervening time period. The mountains in this region are experiencing their own drought, just as the inter-mountain plateaus are. Only a tiny stretch of North Dakota is not currently experiencing any level of drought. A majority of the High Plains is actually in Extreme drought (red or dark brown). These conditions developed rapidly north of 40 degrees latitude (northern border of Kansas) this year. These locations will benefit somewhat from winter snow, but need spring and summer rain to really get rid of this drought. So far in the month of December, the average temperature for Denver, CO is 37.3°F, which is 7.1°F above normal. The next week or so will include near and below average temperatures, which will reduce this anomaly. With only 12 days left in the month however, December will likely be another month in 2012 that higher than normal temperatures were the rule. Denver’s average November temperature was 43.5°F, 5.2°F above normal. October bucked the 2012 trend with a -1.9°F anomaly (49.0°F average). September was 2.9°F above normal (66.3°F average). In November, there was a -0.34″ precipitation deficit from normal. October was slightly more wet than normal: +0.20″ (1.22″ total), as was September: +1.99″ (2.95″ total). This is largely why drought severity in the Denver area is only moderate and not severe or extreme. Note that most of the positive precipitation anomaly in September was the result of one storm which rained overnight on the 25th into the 26th (1.95″). Without this storm, local drought conditions would likely be worse. Precipitation for 2012 remain anomalously low. The NWS recorded 9.89″ of precipitation so far this year, compared to a normal of 14.17″ (-4.28″ or 30% deficit). In contrast, 2011 was a wet year with 17.31″ through Dec. 31st. 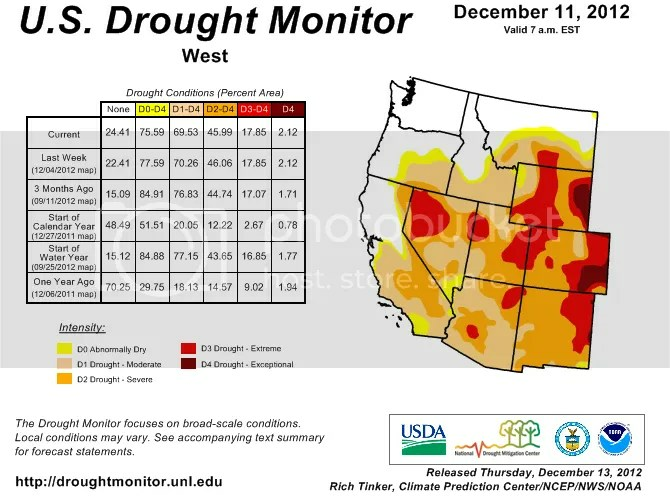 We all hope 2013 returns to normal or above average conditions so that this drought ends. Data from Denver-Boulder NWS Office. 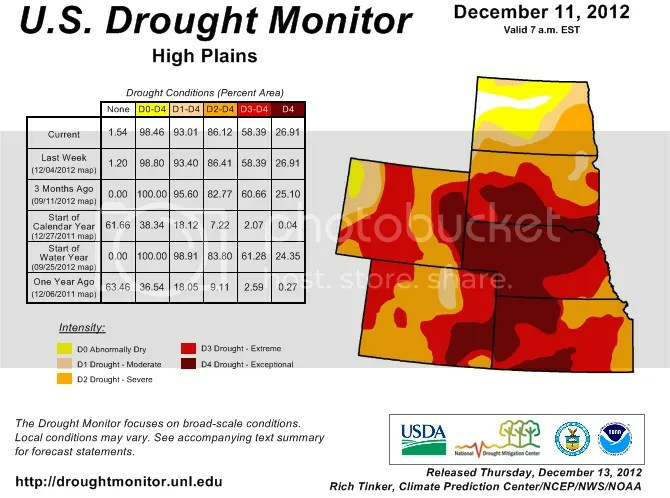 Categories: drought, environment, science | Tags: 2012 drought, Denver precipitation, Denver temperature, drought | Permalink. How Much Of The Big 3 Will Obama Give Away Just To Make A Deal? We heard plenty of rhetoric from Obama super-supporters leading up to the November election: how we had to vote for Obama because crazy ol’ Mitt Romney would destroy the country. It turns out Democrats are just as eager to scare-monger as Republicans are when it comes to protecting those in power from accountability. Largely left unsaid was what Obama would do if re-elected. I argued with many friends about this topic. I saw what the first-term was all about: taking progressive policies off the table prior to negotiation, negotiating for too long, yielding concession after concession while not getting anything of equal value in return from Republicans who only wanted to see him lose the 2012 election. Now that Obama has been reelected, a political “crisis” that Obama and Congress purposefully created for themselves needs our attention. The fiscal curb is approaching. For a couple of weeks, Obama made a good show of touring the country and showing voters how smart they were to vote for him, because he wasn’t going to capitulate and concede on tax cuts for the obscenely rich or the Big 3: Medicare, Medicaid, and Social Security. Social Security doesn’t add to the deficit because it has a guaranteed revenue stream. Medicare and Medicaid could be made solvent for decades with minor adjustments that have nothing to do with things Republicans think they do. I had no doubt we would see the following. Obama made the following proposal yesterday: in exchange for extending middle-class tax cuts, raising the debt limit, extending unemployment benefits, and new spending on infrastructure, he would continue Bush’s high-income tax cuts for income up to $400,000 and would cut Social Security benefits. That’s $1.3 trillion in revenue for $850 billion in spending cuts. Obama has already given up on raising taxes for incomes over $250,000. And he threw Social Security under the bus. For nothing in return. Mark my words: the Big 3 will take massive hits. And unlike in 2005 when the country resisted a Republican President doing it, a Democratic President will do it in 2012. Republicans will successfully get even more spending cuts in programs that need only slight tweaks while raising the income limit that gets subjected to a return to tax rates under Clinton than is present in this offer. How do I know? Speaker Boehner quickly rejected the President’s offer. Why? Because it ensures that Obama will continue to foolishly engage with the Speaker in closed-door meetings instead of speaking in front of the American people. If he did the latter, as was his initial strategy, Boehner would have to agree to the President’s proposal. Because Republican plans consist of everything Americans don’t want to see: slashing unemployment insurance, tax hikes on the middle class while the rich walk away untouched, cuts to the Big 3, etc. And here is why that will happen: Barack Obama wants his legacy to be defined by his ability to make deals with Republicans. The specific details don’t matter that much to him. He wants to be perceived as someone who gets things done, regardless of who came up with the idea in the first place. Health care? Let’s try the Republican plan Mitt Romney got through in Massachusetts. Climate Change? Let’s try the Republican plan from the 1990s. Budget balancing? Let’s try what Republicans have wanted for decades: no social programs and lots of defense spending. The best part? We’ll all do it together! Yay! Be happy, Democrats! You prevented the world-ending Mitt Romney from being elected and now your party’s President will dismantle the most successful programs that kept millions of Americans out of poverty in the 20th century. Because we all had to vote for the lesser of two evils. Phew, disaster was narrowly avoided, wasn’t it? Categories: economy, framing, policy, politics | Tags: 2012 election, capitulation, deficit, fiscal policy, Medicaid, Medicare, policy, President Obama, Social Security, Speaker Boehner | Permalink. The Scripps Institution of Oceanography measured an average of 392.92ppm CO2 concentration at their Mauna Loa, Hawai’i’s Observatory during November 2012. 392.92ppm is the highest value for November concentrations in recorded history. Last year’s 390.31ppm was the previous highest value ever recorded. This November’s reading is 2.61ppm higher than last year’s. This increase is significant. Of course, more significant is the unending trend toward higher concentrations with time, no matter the month or specific year-over-year value, as seen in the graphs below. The yearly maximum monthly value normally occurs during May. This year was no different: the 396.78ppm concentration in May 2012 was the highest value reported this year and in recorded history (neglecting proxy data). If we extrapolate this year’s maximum value out in time, it will only be 2 years until Scripps reports 400ppm average concentration for a singular month (likely May 2014). Note that I previously wrote that this wouldn’t occur until 2015 – another climate variable that is increasing faster than energy or climate experts predicted. I’ve seen comments in the skeptic blogosphere that CO2 measured at Mauna Loa should be higher than anywhere else because of its elevation and specific location. This is an effort to challenge the credibility of the dataset. It is important to understand that this statement exists somewhere between correct to purposefully confusing to outright deceitful. CO2 is a well-mixed constituent of the atmosphere. That means that emissions of new CO2 are quickly and pretty evenly distributed in space. While point locations might vary between each other (differences between polar and tropical CO2 concentrations at the same point in time vary the most, for example), the observations at Mauna Loa are very representative of those found across the set of observation stations on the globe. In addition, as the graphs below will help demonstrate, the historical record is very clear – concentrations have done only one thing in the past 50+ years at any station you want to discuss: increased. There has been no plateauing or decrease in that time period. That being said, it is worth noting here that stations measured 400ppm CO2 concentration for the first time in the Arctic earlier this year. The Mauna Loa observations represent more well-mixed (global) conditions while sites in the Arctic and elsewhere more accurately measure local and regional concentrations. That is why scientists and media reference the Mauna Loa observations most often. Earlier in the year, I predicted that 2012 would not see an average monthly CO2 concentration below 390ppm. It wasn’t the hardest prediction to make: the trend was going up at a steady rate and based on humanity’s continued reliance on fossil fuels, we weren’t going to break that trend this year. The next prediction to verify is the first month at Mauna Loa during which Scripps records an 400ppm average. After that, the first year during which the minimum concentration is at least 400ppm, which I think will occur within the next 5 years. Figure 1 – Time series of CO2 concentrations measured at Scripp’s Mauna Loa Observatory in November: from 1958 through 2012. Figure 2 – Historical (10,000 year) CO2 concentrations from ice core proxies (blue and green curves) and direct observations made at Mauna Loa, Hawai’i (red curve). Figure 3 – Historical record of CO2 concentrations from ice core proxy data, 2008 observed CO2 concentration value, and 2 potential future concentration values resulting from lower and higher emissions scenarios used in the IPCC’s AR4. Note that this graph includes values from the past 800,000 years, 2008 observed values (~6-8ppm less than this year’s average value will be) as well as the projected concentrations for 2100 derived from a lower emissions and higher emissions scenarios used by the IPCC’s Fourth Asssessment Report from 2007. Has CO2 varied naturally in this time period? Of course it has. But you can easily see that previous variations were between 180 and 280ppm. In contrast, the concentration has, at no time during the past 800,000 years, risen to the level at which it currently exists. That is important because of the additional radiative forcing that increased CO2 concentrations impart on our climate system. You or I may not detect that warming on any particular day, but we are just starting to feel their long-term impacts. Moreover, if our current emissions rate continues unabated, it looks like a tripling of average pre-industrial concentrations will be our reality by 2100 (278 *3 = 834). 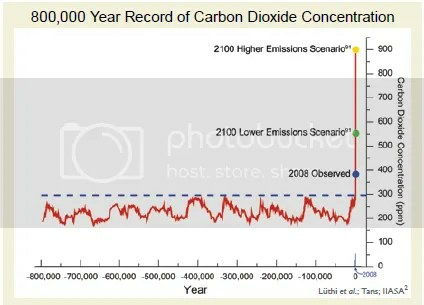 This graph clearly demonstrates how anomalous today’s CO2 concentration values are (much higher than the average recorded over the past 800,000 years). It further shows how significant projected emission pathways are. I will point out that our actual emissions to date are greater than the higher emissions pathway shown above. This reality will be partially addressed in the upcoming 5th Assessment Report (AR5), currently scheduled for public release in 2013-14. Given our historical emissions to date and the likelihood that they will continue to grow at an increasing rate for at least the next 25 years, we will pass a number of “safe” thresholds – for all intents and purposes permanently as far as concerns our species. It is time to start seriously investigating and discussing what kind of world will exist after CO2 concentrations peak at 850 or 1100ppm. No knowledgeable body, including the IPCC, has done this to date. To remain relevant, I think institutions who want a credible seat at the climate science-policy table will have to do so moving forward. The AR5 might possibly fill in some of this knowledge gap. I expect most of that work has recently started and will be available to the public around the same time as the AR5 release, which is likely to cause some confusion in the public. As the second and third graphs imply, efforts to pin any future concentration goal to a number like 350ppm or even 450ppm will be incredibly difficult – 350ppm more so than 450ppm, obviously. Beyond an education tool, I don’t see the utility in using 350ppm – we simply will not achieve it, or anything close to it, given our history and likelihood that economic growth goals will trump any effort to address CO2 concentrations in the near future (as President Obama himself stated recently). That is not to say that we should abandon hope or efforts to do something. On the contrary, this series informs those who are most interested in doing something. With a solid basis in the science, we become well equipped to discuss policy options. I join those who encourage efforts to tie emissions reductions to economic growth through scientific and technological research and innovation. This path is the only credible one moving forward. Categories: environment, global warming, policy, science | Tags: 350ppm, 390ppm, 400ppm, carbon emissions, climate policy, CO2 concentrations, IPCC AR4, IPCC AR5, marketing, Mauna Loa Observatory, public policy, Scripps | Permalink. This is the biggest one. Too many studies focused on moderate emission pathways, when yearly updates showed our actual emissions were on the high range of those considered by the IPCC. I actually posted on this two days ago: CO2 Emissions Continue to Track At Top of IPCC Range. This has implications for every other process that follows. More specifically, if the heat is transported quickly to the deep ocean (>2000ft), the sea surface temperature doesn’t increase rapidly. Nor does atmosphere or land temperatures change. This is true at least in the short-term. When the ocean transports this heat from the deep back to the surface, we should be able to more easily measure that heat. Put simply, the temporary hiatus of temperature rise is just that: temporary. Are we prepared for when that hiatus ends? The relatively small increase in near-surface air and land temperatures is thus explained. The IPCC never claimed the 4.3° to 11.5°F temperature rise (AR4 projection) would happen by 2020 – it is likely to happen by 2100. Expect more synergy between projected temperatures and observed temperatures in the coming years. Also remember that climate is made up of long-term weather observations. Additionally, aerosols emitted by developing nations have been observed to reflect some of the incoming solar radiation back to space. Once these aerosols precipitate out of the atmosphere or are not emitted at some point in the future, the absorption of longwave radiation by the remaining greenhouse gases will be more prominent. The higher the concentration of gases, the more radiation will be absorbed and the faster the future temperature rise is likely to be. These aerosols are thus masking the signal that would otherwise be measured if they weren’t present. This is the big story of 2012. The Arctic sea ice melted in summer 2012 to a new record low: an area the size of the United States melted this year! Even as late as 2007 (prior to the previous record-low melt), the IPCC projected that Arctic ice wouldn’t decrease much until at least 2050. Instead, we’re decades ahead of this projection – despite only a relatively small global temperature increase in the past 25 years (0.15°C or so). What will happen when temperatures increase by multiple degrees Centigrade? These are the land-based sheets, which are melting up to 100 years faster than the IPCC’s first three reports. 2007’s report was the first to identify more rapid ice sheet melt. The problem is complex cryospheric dynamics. Understandably, the most remote and inhospitable regions on Earth are the least studied. Duh. That’s changing, with efforts like the fourth International Polar Year, the results of which are still being studied and published. Needless to say, modern instrumentation and larger field campaigns have resulted in advances in polar knowledge. It’s nice being relevant. I just posted something new on this yesterday: NOAA Sea-Level Rise Report Issued – Dec 2012. The 3.3mm of sea-level rise per year is higher than the 2001 report’s projection of 2mm per year. Integrated over 100 years, that 1mm difference results in 4″ more SLR. But again, with emission and energy underestimates, the 3.3mm rate of SLR is expected to increase in future decades, according to the latest research. Again, another mm per year results in another 4″ 100 years from now. Factors affecting SLR that the IPCC didn’t address in 2007 includes global ocean warming (warmer water takes up more volume), faster ice sheet melt, and faster glacial melt. Additionally, feedback mechanisms are still poorly understood and therefore not well represented in today’s state-of-the-art models. The first 3 IPCC reports didn’t even mention this effect. In the past 250 years, ocean acidity has increased by 30% – not a trivial amount! As the article points out, research on this didn’t even start until after 2000. Another area that is not well-studied and therefore not well understood. The mechanics and processes need to be observed so they can be modeled more effectively. 1.5 trillion tons of carbon are locked away in the currently frozen tundra. If these regions thaw, as is likely since the Arctic has observed the most warming to date, methane could be released to the atmosphere. Since methane acts as a more efficient GHG over short time frames, this could accelerate short-term warming much more quickly than projected (See temperatures above). The SciAm article points out the AR5, to be released next year, will once again not include projections on this topic. This is probably the most controversial aspect of this list. Put simply, no one knows where potential tipping points exist, if they do at all. The only way we’re likely to find out about tipping points is by looking in the past some day in the future. By then, of course, moving back to other side of the tipping point will be all but impossible on any time-frame relevant to people alive then. There are plenty of problems with the UNFCCC’s IPCC process. Underestimation of critical variables is but one problem plaguing it. Blame it on scientists who, by training, are very conservative in their projections and language. They also didn’t think policymakers would fail to curtail greenhouse gas emissions. Do policymakers relying on the IPCC projections know of and/or understand this nuance? If not, how robust will their decisions be? The IPCC process needs to be more transparent, including allowing more viewpoints to be expressed, say in an Appendix compendium. The risks associated with underestimating future change are higher than the opposite. Categories: environment, global warming, policy, science | Tags: arctic sea ice, climate change, climate policy, climate underestimations, CO2 emissions, global temperatures, ice sheets, IPCC projections, methane, ocean acidification, policy, Scientific American, sea level rise, tipping points, tundra | Permalink. This is a busy time of year for the sciences with the annual American Geophysical Union’s and the international Conference of Parties meetings occurring simultaneously. NOAA has issued a number of reports in recent days, none of which are overflowing with good news. Today, NOAA released their Global Sea Level Rise Scenarios for the United States National Climate Assessment. It was produced in response to a request from the U.S. National Climate Assessment Development and Advisory Committee and consists of a review and synthesis of recent scientific publications examining global sea level change. Why is this report important? “More than 8 million people in the US live in areas at risk of coastal flooding. Along the Atlantic Coast alone, almost 60 percent of the land that is within a metre of sea level is planned for further development, with inadequate information on the potential rates and amount of sea level rise.” The public, policymakers and planners need to know what to expect with respect to sea-level rise this century: where should development occur or be restricted and why? The report is based on four plausible scenarios. 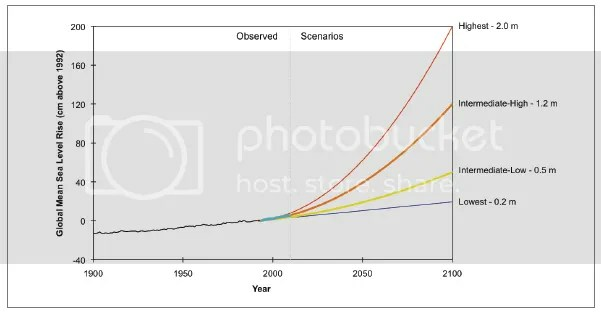 Scenario 1 is simply a linear extrapolation of the historical sea-level rise (SLR) rate out to 2100. Scenario 2 is based only on projected ocean warming. Scenario 3 builds on 2 by adding recent ice sheet loss (land-based). Scenario 4 reflects ocean warming and the maximum plausible contribution of ice sheet loss and glacial melting. Scenario 1 is appropriate for communities which can assume high risk or for short-term projects. Scenario 4, in contrast, is meant for places which can’t accept risk. Note that these values are not predictions, but are projections. That is, NOAA isn’t saying that if X and Y happen, then the Intermediate-High scenario is a prediction. The scenarios present a framework for policymakers and the public to use to make decisions. The range of potential SLR shown in the table and figure above might lead some to conclude that ‘high confidence” in that range is misplaced by NOAA. This is a gross misinterpretation of what is presented. The level of uncertainty, which will always exist, is actually useful to policymakers. Given this range of projections, people can leverage local and regional knowledge to come to better decisions than they would without this range. Something quantified is better than a big shrug when planning, after all. With the governors of New York, New Jersey, and Connecticut requesting $80 Billion to clean up and rebuild (better) after Hurricane Sandy, future projections of sea-level rise can obviously provide guidance regarding what and how to rebuild in addition to where to rebuild. Policy development and planning will have to take these and other projections into heavier account this century than they did last century. An estimate of how many billions of dollars can potentially be saved by incorporating this information would also be useful. Categories: environment, global warming, NOAA, science | Tags: climate assessment, climate change, climate change effects, climate change policy, environment, global sea level, global sea level rise, NOAA sea level data, policy, science | Permalink.